Home > ARENAWIRE > Holding a mirror up to the future. What is CST? Holding a mirror up to the future. What is CST? Solar power is an essential element in Australia’s future energy mix, that much is clear. But it’s not just the solar you most likely know – photovoltaic technology – that will probably replace the coal fired power generators of today. Technology based on something as simple as a mirror could be one of the answers to long term, renewable electricity supply in Australia. 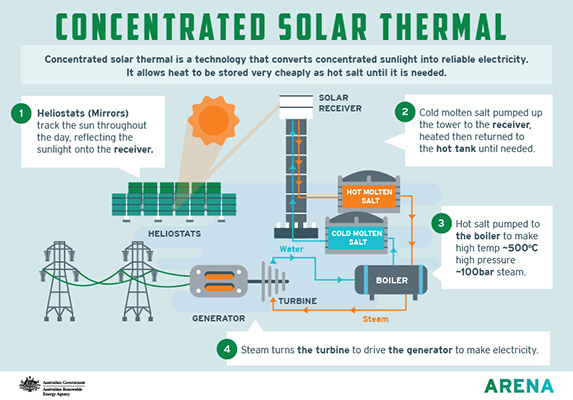 Meet concentrated solar thermal. Some versions of the technology look like dramatic interlopers from a futuristic age. Huge arrays of heliostats point at domineering structures known as “towers of power” like something cooked up by a Bond-film villain. Others look like rows and rows of giant gleaming dishes, more at home on the set of a sci-fi movie than a power station. 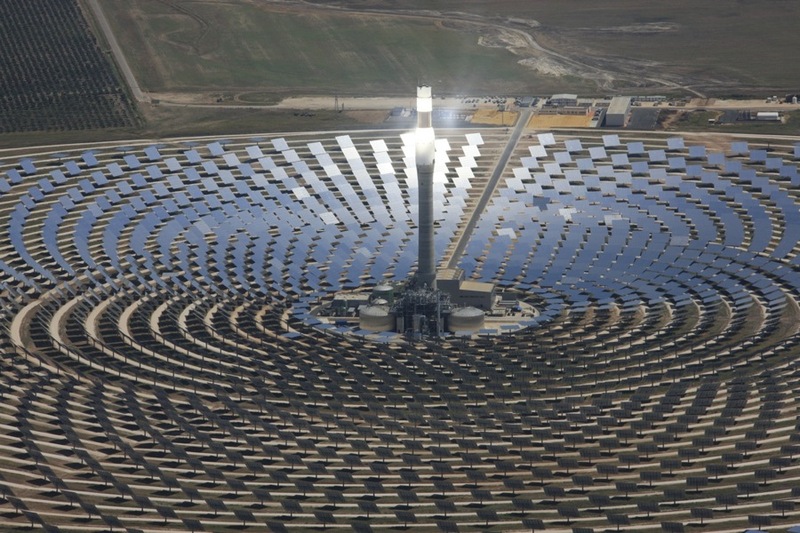 And yet, Concentrated Solar Thermal (CST) power stations have been operating for more than 30 years. There are now more than 5 GW of installed capacity around the world, most of it in the United States and Spain. CST, like photovoltaic technology (PV), harnesses the sun’s energy and turns it into electricity. The difference between them is that PV converts the radiation directly into electricity, while CST directs a system of mirrors to focus light from the sun to one small point. It then converts the accumulated energy into heat which can be stored before it is later turned into electricity. While it’s based on the same idea as PV (converting solar energy to electricity) the major advantage CST has over PV is the built in ability to provide up to 15 hours or more of stored energy, long enough to last through the night. That allows it to provide demand responsive electricity outside of daylight hours. And if not used, that stored energy can be retained for many weeks. PV and wind turbines have become cheaper and cheaper as ways of generating electricity when they are working, but their output is variable (it needs sun and wind). Because of this they require back up from the national grid or another generator to provide energy when sunlight or wind isn’t available. Battery storage or pumped hydroelectric storage are the subject of much interest as a solution to this but CST could also provide a cost effective solution. While PV can be installed at the household level or at very large solar farms CST isn’t suitable for small scale installation, it’s a complex system that requires steam turbines and needs economies of scale to make it viable. The capital costs are currently higher than they are for coal or gas generators of equivalent size, the difference is that there are no ongoing fuel costs, and zero emissions. Keith Lovegrove, Managing Director of ITP Thermal, estimates that the total cost of energy per MW hour of a new gas fired generator would be roughly the same as a new CST generator, and that’s without considering any potential cost of carbon. There are a four commonly acknowledged kinds of mirror configurations in CST plants. Parabolic troughs account for around 90% of the currently operational CST technology. This is the most commercially mature configuration, with 30 years of operation in California proving its viability. However, this method is comparably cost inefficient when it comes to integrating thermal energy storage in standard configurations. A ‘parabolic trough’ style CST installation. IMAGE: Rebecca Dunn. Linear Fresnel is a less mature, but very promising, technology. Research shows it has similar performance as parabolic troughs, but proponents argue is much cheaper to build. Towers surrounded by mirror fields are the new fashion in CST, and are progressing at pace. About half of all the CST plants currently under construction around the world are tower configurations. At the moment, it appears that the tower/molten salt storage combination is the most cost effective of all the currently installed CST technologies. Dish is the least mature technology, research has proven it’s highly efficient, but it needs more development before it’s commercially viable. Despite the variations in the type of mirrors used, the generator plant configuration almost always remains the same. Liquid is heated by the light collected from mirrors, transferred to molten salt for storage, and then used to heat water to power steam turbines, the same ones used in old style coal fired generators, but without carbon dioxide emitting coal. ARENA has established the Australian Solar Thermal Research Initiative (ASTRI) to undertake research that will improve the efficiency and operation of future CST systems, while lowering costs. With $35 million in funding over 8 years, ASTRI’s key activities include higher temperature systems and more efficient power generation. ARENA is currently calling for information from industry participants on the costs and benefits of CST. This information will help ARENA and the CEFC to determine the scope and focus of government assistance for the deployment of CST in Australia. A ‘linear fresnel’ style CST installation. 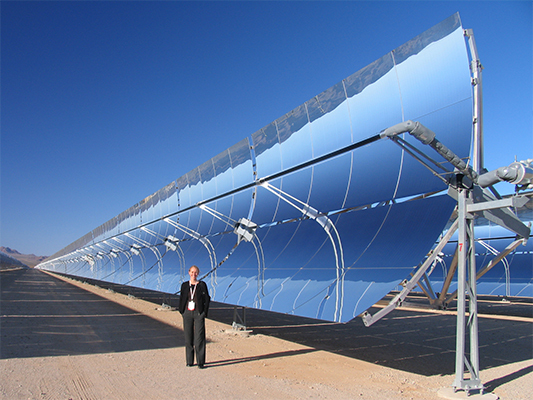 IMAGE: AREVA Solar. It is the first step in exploring how concentrated sunlight could generate reliable, affordable renewable energy with built-in storage for our national grids. WHERE MIGHT WE SEE THIS? 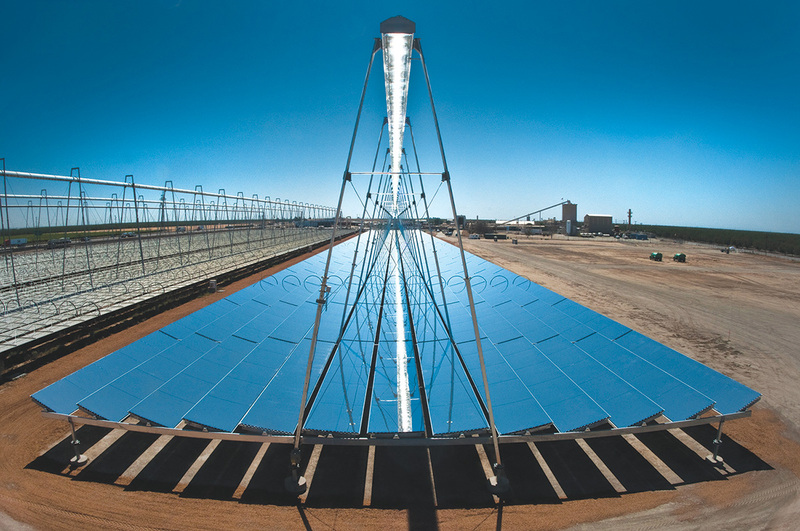 ARENA’s new call aligns with the Federal Government’s offer to make up to $110 million available for an equity investment to accelerate and secure delivery of a concentrated solar thermal (CST) project in Port Augusta. Despite the expectation that proven CST technology will be implemented in a large-scale plant at Port Augusta, some of the more cutting edge technology, like graphite storage and dish systems, will likely make it onto the list of technology to consider for smaller pilot-scale projects. The options are varied, exciting and potentially game changing for Australia’s energy mix. 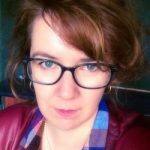 Jane Gilmore is a freelance journalist, with a strong focus on data journalism. She writes for the Sydney Morning Herald, The Guardian, Meanjin, The Age, SBS, The Saturday Paper and others. World-leading solar technology, born in Melbourne? That’s ultra-cool.